Wow, what great artwork. A brilliant concept! This is a live recording that sounds as good as a studio take, but captures all the energy of the band in concert. Highly recommended! A fine performance of this venerable Pollo Del Mar classic opens the CD. The twin guitar assault of Jono's and Ferenc is better than ever! Glorious glissandoes and ringing chords, with that liquid melody line and underlying bass, which seems to define the song. Very cool! Carabunga, dude! "Cutlass Supreme" sounds better every time I hear it. A glorious take, with grumble and rumble and the signature PDM sound. Powerful and full bodied. Remaining my favorite PDM song, "Annabelle Lee" is magnificent live. Brilliant writing and flawless delivery make this sparkle. The dark underbelly supports the swimming whammified guitars. Amazing! This is an exceptionally fine medley! the sound is crisp and clean, and the carnival grins abound. Henry Mancini's "Baby Elephant Walk" is even more demented in this slow arrangement, and as it picks up speed in each verse, it gets grinnier and spicier. Spashy and too fun. It transitions into "Music To Watch Girls By" effortlessly. This is more straight, that is to say more true to the point of the original. Pristine and fun. From here, they transport us to the world of Vince Guaraldi's precious "Linus and Lucy," where few surfbands have ventured. Aside from JFA's version under the title "Charlie Brown," this is just about it. Brilliantly suave and exciting. Based on the Ventures' arrangement, this has been fully adapted to the sparkle and edgy sound of Pollo Del Mar. An excellent performance of a rich and dramatic classic instro from the fifties musical West Side Story. Another of the truly fine originals from Pollo Del Mar, this tune sports an infectious rhythm and whammified water mark. The lads do right by "Playa Pistola" with charm and liquid guitar lines. The chanted intro sounds cooler every time I hear. 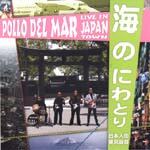 "Gate'" is a rich song Pollo Del Mar have been doing for many years. Angular and emotional, and with its emotional development brought forth, this is simply joyous. I love the ska break! Jazzy progressions, screaming feedback chords, high psycho drama, and an infectious melody. This is by far the best they've done this on record. Stunning! "2314-B" was born in 1966 with a band called Sidetrack whose Baby album was almost issued by Elektra. Fanciful and bouncy, with edge and dissonance, it's catchy and very unusual. A fine performance. This is a new song, with a delicate whammy sound and coastal adventure feel. Those PDM chords and the lure of the curl are abundant. There is more than surf here, with writing and arranging that are brilliant. A magnificent song. Mike Maxfield's (Dakotas) claim to surf fame "The Cruel Sea" is well done, with the rolling circular counter points well executed. Infectious and fun. Twin note guitar, vibrating circular rhythm, fuzz leads, and the surf is just over the hill as dawn approaches. "Ubik" drips surf and sun and adventure. A brilliant piece of writing. "Four Sticks" is a new song, with howling feedback raining on the tube breaking on offshore. Psychedelic surf if ever there was. "Moon Over Marin" takes you to a thicker sound, where the ocean is just in sight beyond open fields of poppies. The thick whammy is somewhat beautiful, and definitely fluid. "Devil's Slide" is a song of Highway 1 where the sea keeps taking the cliffs and the roadbed with them. A fine song that seems like a natural outgrowth of the medley. Dramatic and chunky. "Jonny Foo: Ninja Chiropractor" is dramatic and pure Pollo Del Mar. It sports a funky sorta feel and a throbbing rhythm. Powerful and sophisticated, and fluid. Dramatic and very effective, and better than the studio version. An oldie from the early daze of Pollo Del Mar, "Route 666" is dramatic and angular. This performance is pumped up and tuff. This is an excellent performance of an early Pollo Del Mar song in tribute to the Insect Surfers. The tune has held up very well over the years. It's very surfy in the desert sense, and with the stronger drummer, it's very tuff. Fine track. This is a fine and tuff performance of the TV theme. Rich and immediate, "Hawaii Five-0" sounds as good as ever. It is among the best covers of this song around. A circular countermelody offsets the reverbed and whammied leads. The double picked verses are tuff and gritty. An excellent performance, and a very interesting song.